Master the technique for this coastal recipe. Though Peruvians claim ceviche as their national dish, chilled, citrus-dressed seafood is a mainstay in homes and restaurants in Central and South America almost anywhere ocean meets coastline. A knockout ceviche is the result of a delicate balance of heat, salt, acidity, freshness, and crunch. Although it’s widely believed that soaking raw fish in an acidic liquid “cooks” the seafood, it actually just denatures the protein. As with any seafood recipe, it’s essential to use the freshest, most sustainably sourced fish and shellfish you can get your hands on, both for flavor and for the sake of food safety. 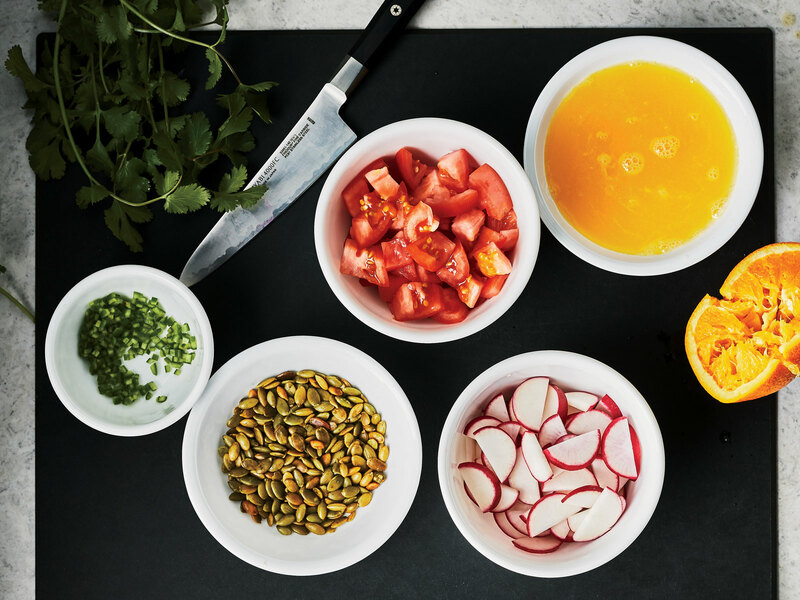 After you’ve nailed the classic ceviche style in the steps below, have fun playing with different add-ins, toppings, and chips for dipping to create your own signature style. 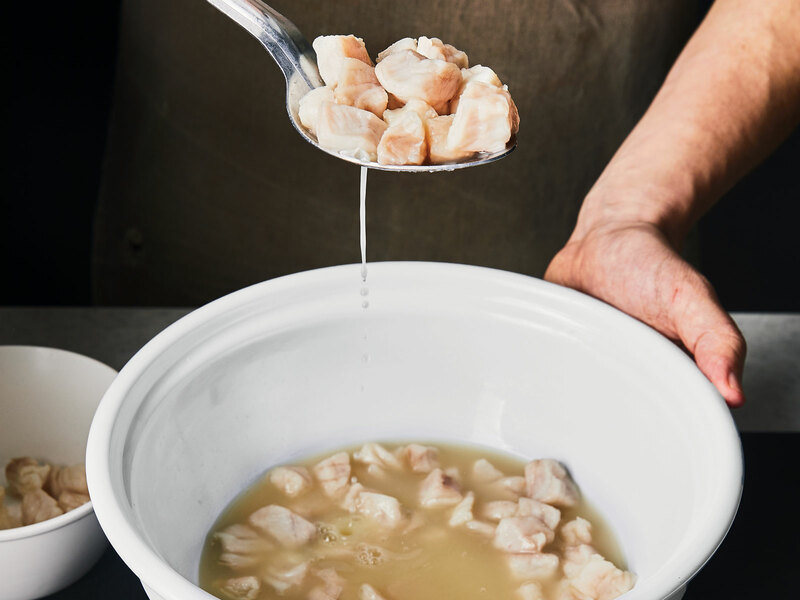 In Latin America, the preferred fish for ceviche is white-fleshed and lean. Favorites include flounder, red snapper, and orange roughy. Halibut and sashimi-quality tuna also work very well. Shellfish should be blanched before using in ceviche recipes to ensure food safety. Cook shellfish in boiling salted water until just opaque, then plunge into ice water to cool completely. Use a sharp knife to skin and debone fish. Remove blood- line by carefully slicing along either side of the bloodline, cutting in a V shape; discard. Remove pin bones with tweezers. 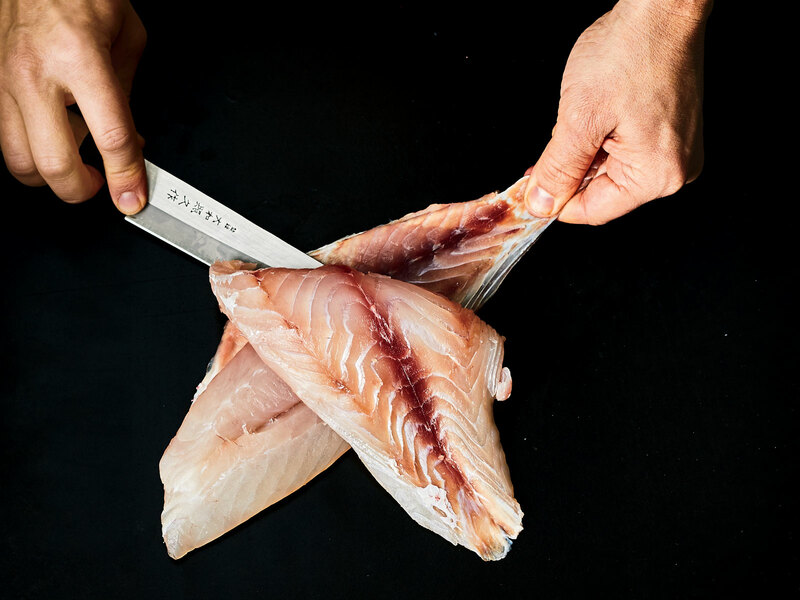 Working with chilled fillets, place on a cutting board, and press gently with your palm to flatten. 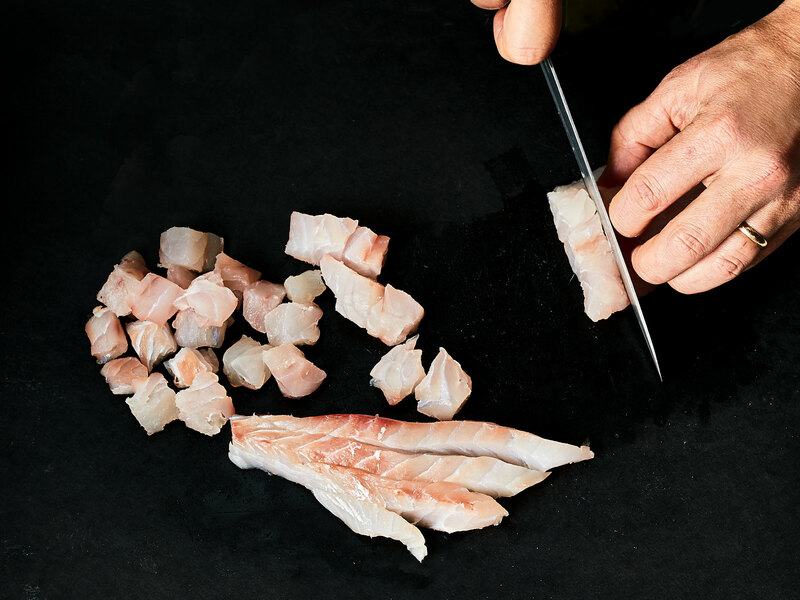 Slice fish into uniform pieces as directed, using a ruler, if desired. Place fish in a medium bowl, and cover completely with fresh citrus juice. (Leaving fish exposed to the air will result in an inconsistent final texture.) Chill 30 minutes. While the fish marinates, prepare mix-ins and garnishes. 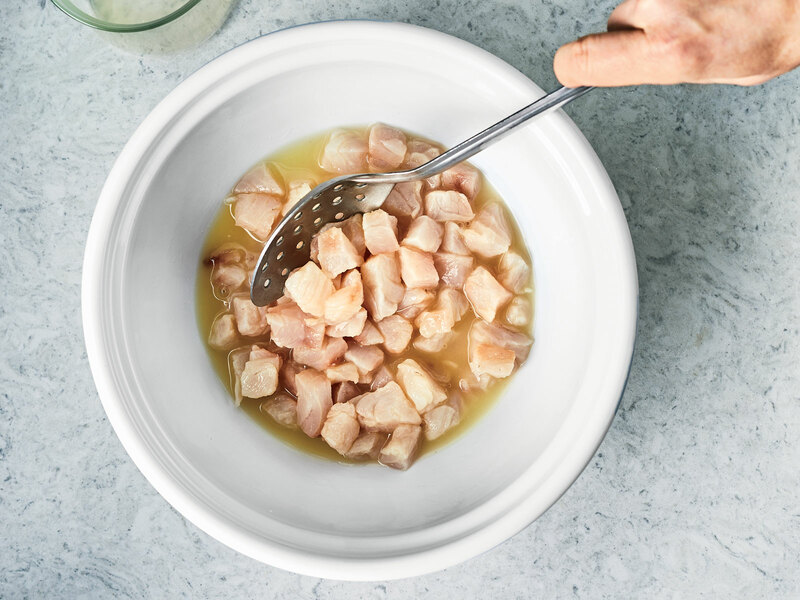 Careful, inten- tional knife work is impor- tant: The other ingredients should be similar in size to the cubed fish so the ceviche is easy to eat. 5. Leche de Tigre: Drain or Retain? The marinating liquid, dubbed leche de tigre (tiger’s milk), is drained and discarded in this recipe. If you’re into it, down a shot—it’s rumored to be a powerful hangover remedy. Toss marinated fish with vegetables, and reserve delicate garnishes like herbs until just before serving to protect their tender leaves from the acidic marinade. Add a sprinkle of salt if needed, and don’t forget the chips!